The classic tale of The Three Little Pigs is adapted for a modern day audience in this funky new interpretation by George Stiles and Anthony Drewe, the award-winning team behind Honk! and Mary Poppins. In this production, the three pigs are very very special indeed. After leaving their overcrowded home, the pigs become star performers who love to sing! Like all piglets, the three little pigs certainly miss their mother now that they have fled the sty. Even though they are superstars, they miss their mums special “hogs and kisses,” which are no longer enough to protect them from the big bad wolf who is hell bent on infiltrating their makeshift sty. Whilst the pigs love to sing together, they each have different personalities ans attributes that could help them fend off the wolf. Let's just hope he doesn't start huffing and puffing! Casting includes Simon Webbe of former boy band, Blue. Webbe tackles the role of the nasty big bad wolf. 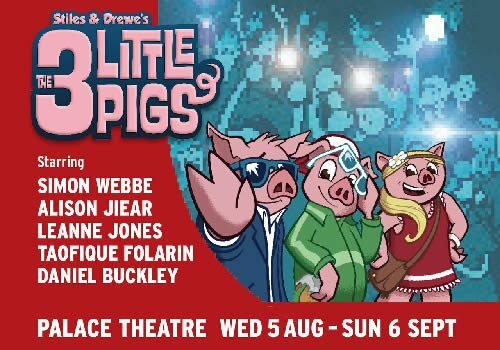 Dan Buckley (Loserville, The Book of Mormon) Leanne Jones and Taofique Folarin play the superstar pigs and Alison Jiear plays Mother. Ewan Jones choreographs the show, which features set designs by Jason Denvir. Olivier Fenwick provides lighting and Jon Fiber provides sound. The Three Little Pigs is a children's show aimed at 3+ year olds.